The Estates 36 in. vanity combo with black granite top features a concealed, fully extendable storage drawer behind 2 inset doors, providing you with the necessary storage space you need for your bathroom essentials. The vanity's antique white finish, hand-carved wooden scroll accents and antique brass hardware, along with its granite top, offer timeless elegance that can enhance your bathroom's appeal. Add understated elegance to your bathroom with the Delano Collection. Spare in style, we designed Delano to accent a range of bathroom dicor, blending simple beauty with unmatched versatility. Whether you choose the Taupe Glaze or White Finish, the 36-inch Delano features a durable solid wood frame and sophisticated black bronze pulls, 1 flipped down DWR and 2 functional DWRs. The combo includes a durable black granite top and rectangular white vitreous china sink. Add understated elegance to your bathroom with the Delano Collection. Spare in style, we designed Delano to accent a range of bathroom dicor, blending simple beauty with unmatched versatility. Whether you choose the Taupe Glaze or White Finish, the 60-inch Delano features a durable solid wood frame and sophisticated black bronze pulls, 2 flipped down DWRs and 4 functional DWRs. The combo includes a durable black granite top and dual rectangular white vitreous china sinks. The Emma 61 inch vanity combo embraces purity of design and masterful construction. The vanity in White finish paired with black bronze hardware brings to life the cabinet's simple, clean lines. Emma provides abundant storage and Zen-like functionality. Soft-close glides and hinges keep things quiet and the solid wood frame and dovetail joints keep things strong. It includes a black granite top and dual rectangular undermount sinks. The collection also features complementary mirror and linen tower to expand the look. Emma makes your bathroom beautiful. The Layla 37 inch vanity combo presents a sleek and attention-grabbing profile that will make your bathroom "The Room" in your home. A pristine white finish and dazzling blue glass hardware please the eye while the solid wood frame, dovetail joint construction, and soft-close glides and hinges testify to quality craftsmanship. Layla's uncluttered panels allow the beauty of its design and construction to shine through, and the combo comes with a black granite top and oval undermount sink. A matching mirror and linen tower allow you to create a complete design palette. Let Layla bring your bathroom to life. Estates 36-inch W Vanity Combo in Antique White Finish with Granite Top in Black The Estates 36 in. vanity combo with black granite top features a concealed, fully extendable storage drawer behind 2 inset doors, providing you with the necessary storage space you need for your bathroom essentials. The vanity's antique white finish, hand-carved wooden scroll accents and antique brass hardware, along with its granite top, offer timeless elegance that can enhance your bathroom's appeal. 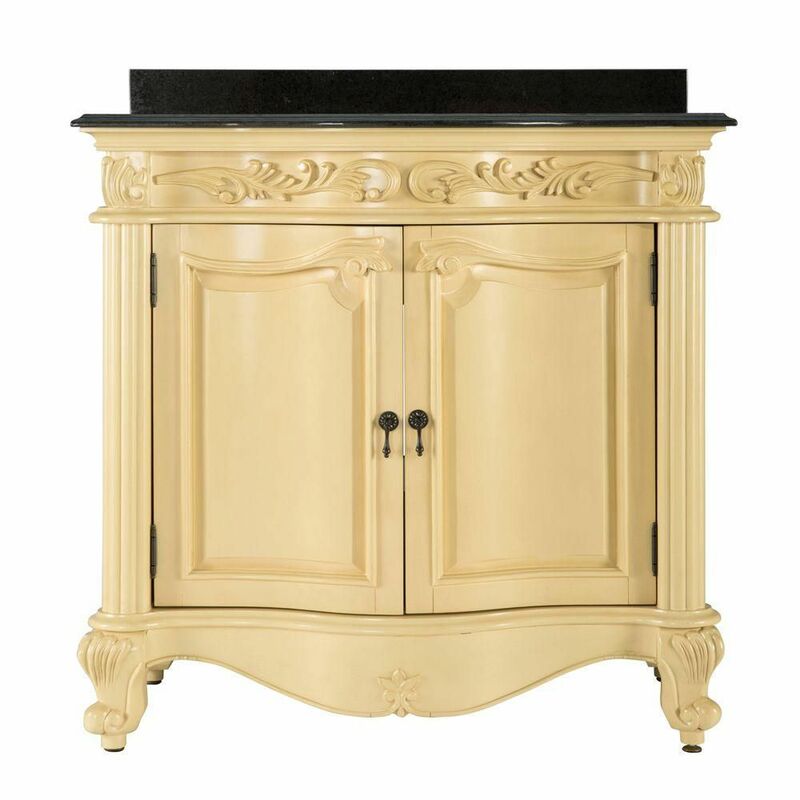 Estates 36-inch W Vanity Combo in Antique White Finish with Granite Top in Black is rated 4.2 out of 5 by 9. Rated 4 out of 5 by felicity from There is a drawer in the cabinet. The color is bit darker in person. It is well made and almost s... There is a drawer in the cabinet. The color is bit darker in person. It is well made and almost same as photo but very very heavy. Rated 5 out of 5 by 123qw from Beautiful and good quality Beautiful vanity, all details are fine made. Color is yellowish and fits well antique (heritage) brass faucet. Granite top is black with gray, even more rich and beautiful than on the picture. Rated 5 out of 5 by tbuyer from It´s yellow There is a problem with the pictures in Home Depot: in most computers the vanity looks white. It´s not white as others have indicated. It´s actually pretty yellow (think light egg yolk) I'm returning mines because of that, but if it was not for the color I would have kept them. They are very nice, very stylish. Rated 4 out of 5 by Dave from Nice vanity We bought this on sale, so for the price we paid it is a nice piece of furniture for a basement bathroom. We haven't had it long enough to determine its durability though. Rated 5 out of 5 by Shiloh from exactly like the picture! Don't listen to the people saying it is yellow. It's an off white, not bright white, as something antique looking should be. Also,, the granite is definitely black, not brown, as some have reviewed. It's great quality, i bought it at forty percent off and it was a steal. We haven't installed it yet but will next weekend. I'd highly recommend this product! Rated 1 out of 5 by tcorgi from Very disappointing First, it was a yellowish color-not an antique white. Neither of the front doors would remain closed when closed. The paint job on one of the front doors was very poor quality. Did not accept delivery of this piece. Rated 4 out of 5 by Tamdiam from Actual color is ivory; top is green/black granite We ordered the same combo in both the mahogany finish and this bisque. I am happy with both but must admit the mahagony is prettiest. I was hoping for more of a white finish and this is definitely golden ivory. Nevertheless, it works and was really a good buy overall.